The master-planned ME Living community by Lash Group of Companies is at the forefront of a renaissance that is making Scarborough a more vibrant and in-demand home destination. 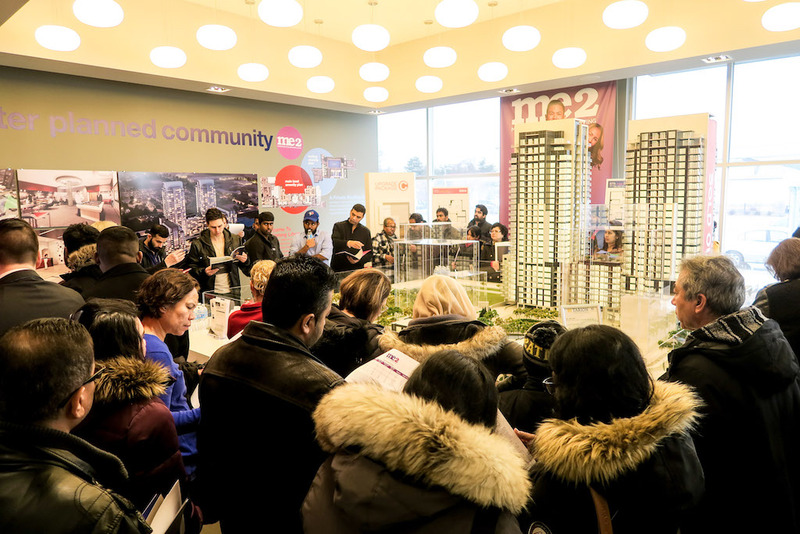 ME2, the second phase, recently held the Grand Opening at the sales centre and already more than 200 families have purchased. Condo purchasers seeking exceptional value and an ideal location are discovering over 25 suite styles at ME2, making this new phase an excellent opportunity to build their future in a convenient and connected location. The incredible value ME2 offers prospective buyers is threefold: price, location, and features. One- and two-bedroom suites (most with dens) from 405 sq. ft. start at an affordable $209,990, a rare find in the entire GTA. Markham Road and Ellesmere offers access to the new LRT system right at the doorstep, and a drive-time of just minutes to Highway 401 and DVP. The immediate neighbourhood has a variety of shops and businesses, and Scarborough Town Centre with more than 200 stores, restaurants and services is just minutes away. The professionally designed tree-lined courtyard of the community will include a scenic pond in summer/skating pad in winter and attached water park. There is also an abundance of parks and golf courses close by. The nearby Scarborough Bluffs offer a picturesque playground for outdoor enthusiasts, water-sports lovers and sun-worshippers. Throughout ME2, every meticulously planned detail is designed to inspire your life, from the grand lobby to the spacious party room with catering kitchen; from the Hollywood-style private theatre to the interactive sports lounge (complete with games area, bar and billiard table); from the rooftop pool to the state-of-the-art fitness room. Within each suite, features and finishes are chosen for their perfect balance of modern form and seamless function. When complete, the ME Living community will encompass condominiums, townhomes, shops and parks for a self-contained lifestyle oasis in the heart of the GTA. With striking exterior design by Turner Fleischer Architects and stunning interiors by Tanner Hill Associates, Lash Group is proud to welcome you home to ME2. Lash Group of Companies has been creating exceptional places to live and work with millions of square feet of development in the GTA and Florida for the past 60 years. Find out for yourself why you belong at ME Living. Visit the Presentation Centre during the Grand Opening Celebration Week at 1151 Markham Road. For more information, call 416-430-0003 or visit online at www.meliving.ca today.